My FRIENDS Which country makes me PROUD ? Dubai standing up to OIL RICH WAHHABI Saudia Royal suckers. Dubai has inaugurated the world’s tallest twisted tower built at a cost of $US272 million ($288.3 million), setting yet another record for skyscrapers and other engineering marvels. 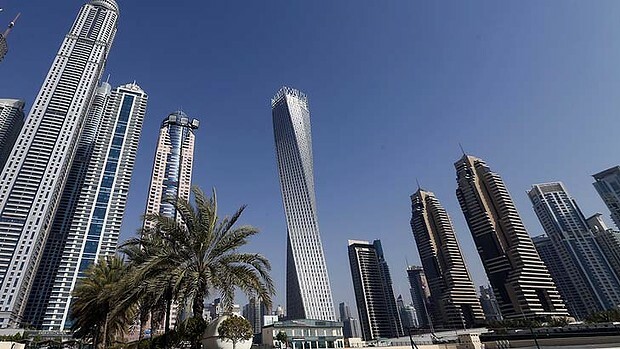 The 310-metre, 75-storey residential Cayan Tower is twisted at 90 degrees from top to bottom and was inaugurated earlier this week in Dubai Marina – a man-made canal overlooking the Gulf. Developer Cayan Real Estate Investment and Development Company said 80 per cent of its residential units had already been sold. Construction began in 2006, but was delayed due to major technical problems and the 2009 economic downturn in Dubai triggered by the global financial crisis. The tower was designed by Chicago-based Skidmore Owings and Merrill, the masterminds behind Burj Khalifa, which is the world’s tallest tower and also in Dubai. 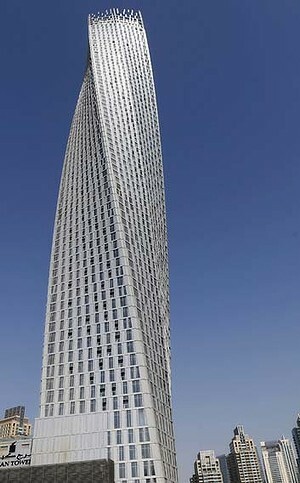 The 828-metre, 160-storey Burj Khalifa broke engineering and architectural records when it opened in January 2010. In May 2012, Dubai opened the 413.4-metre Princess Tower, the world’s tallest residential building, according to the Guinness World Records website. And later in 2012, the emirate inaugurated the world’s tallest hotel – the 355-metre twin tower JW Marriott Marquis Dubai.